Ravens linebacker Ray Lewis is one of several NFL greats in recent memory to ride off into the sunset with a Super Bowl victory. Peyton Manning called it quits on Monday, ending a legendary, Hall of Fame career that fittingly spanned 18 years. It was widely expected that Manning would walk away after winning his second Super Bowl win, but the quarterback understandably took his time before coming to the decision. Manning joins a select list of other star players, all of whom are already in or will be in Canton. A look now at some of the recent stars who received the ultimate send-offs for their star-studded careers. Ray’s “last ride” turned out to be a magical one for the soon-to-be Hall of Fame linebacker. Lewis announced his decision before the 2012 postseason began, and the team responded with four wins en route to the franchise’s second Super Bowl title. Lewis was incredibly emotional throughout, first joining the offense for the final kneel-down in the wild card win against Indianapolis before breaking down in tears after the team’s miracle, double-overtime win in Denver a week later. Despite taunts from billboards in New England, Lewis was able to delay his retirement one more week as the Ravens downed the Patriots in the AFC championship game. 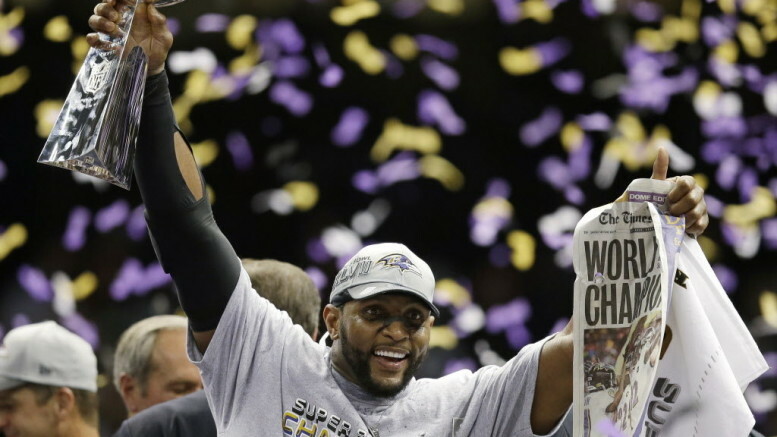 He went out on top when the Ravens held off a furious rally by the 49ers in Super Bowl XLVII. He holds several NFL records, most notably his 13 Pro Bowl nods and 10 All-Pro selections. Lewis survived an incredibly trying 2000 season and won MVP honors in Super Bowl XXXV, but it took him a dozen years to get back and get his second ring. While Lewis was destroying offenses during the 2000 postseason, things didn’t end as happily that season for Strahan. His Giants were demolished, 34-7, in Super Bowl XXXV, and there were some major heartbreaks in the following years. Strahan’s Giants squandered a 24-point lead in the 2002 wild card round at San Francisco, were shut out by Carolina at home in 2005, and lost on a buzzer-beating field goal in Philadelphia in 2006. But in 2007, things came together at just the right time for Big Blue. The G-Men, behind a nearly-flawless Eli Manning, won in Tampa Bay before stunning Dallas and Green Bay on the road to reach Super Bowl XLII. There, as heavy underdogs, they shocked the football world and ended the Patriots’ pursuit of perfection with a 17-14 win. Strahan himself was heard on the sideline saying “17-14…believe it and it will happen,” almost forecasting the final drive that ended in a Plaxico Burress touchdown catch. The upset win was a perfect ending for Strahan, who was elected to the Hall of Fame in 2014. Bettis made the quickest retirement decision of the bunch, saying during the postgame celebration that this was the Bus’ “last stop.” It was a perfect way to go out for Bettis, finally winning the big one in his hometown of Detroit. The Steelers went 15-1 in 2004 but lost at home in the AFC championship game, leaving receiver Hines Ward in tears the next day and Ben Roethlisberger promising Bettis he would get him his long-awaited ring. Pittsburgh was just 7-5 through 12 games in 2005, but won their last four to get the AFC’s sixth and final seed. The Steelers went on to win three road games and become the first No. 6 seed to get to the big game. There, despite Roethlisberger’s struggles, Pittsburgh beat the Seahawks, 21-10, and Bettis ended his 13-year career (10 of which were spent in black and gold) in super fashion. The legendary signal-caller had come up short so many times before the Broncos stunned the Packers in Super Bowl XXXII, and it was fair to wonder even then if Elway would hang them up. Instead, he returned for one more season, and it was a brilliant decision. Denver almost went undefeated, winning its first 13 games before falling to the Giants. No matter, as the Broncos defeated the Dolphins and Jets at home to return to the Super Bowl. There, rather than take on the record-setting, 15-1 Vikings, they faced the Atlanta Falcons, whom they disposed of rather easily. Elway did in fact call in quit three months later, ending his career with two Super Bowl wins in late 90’s after going 0-for-3 in the 80’s. A far-less publicized ride off into the sunset, Zimmerman finally nabbed a ring in his final season after spending the majority of his NFL career in Minnesota but playing his final five years in Denver. Zimmerman, a 2008 Hall of Fame inductee, was a seven-time Pro Bowl selection who actually played two years in the USFL before beginning his NFL journey. He is remembered as a player who neglected to talk to the media and having his offensive line mates follow suit, but is also one of the all-time greats at the left tackle position. He stepped away from the game after the Broncos won Super Bowl XXXII, the franchise’s first Lombardi trophy. Be the first to comment on "Going out on top: Manning joins list of recent greats to end careers with Super Bowl wins"